Is your sites page speed or load time super slow? Do you need to speed up your website? If you answered YES to either one of these questions, you’re in luck, I’m going to teach you how to speed up your website and get a faster load time! People want to be able to find answers to their questions as fast as possible. Studies show that people really care about the speed of a page and so does Google! Google has indicated site speed (and as a result, page speed) is one of the signals used by its algorithm to rank pages – and now it’s even more important for mobile searches. 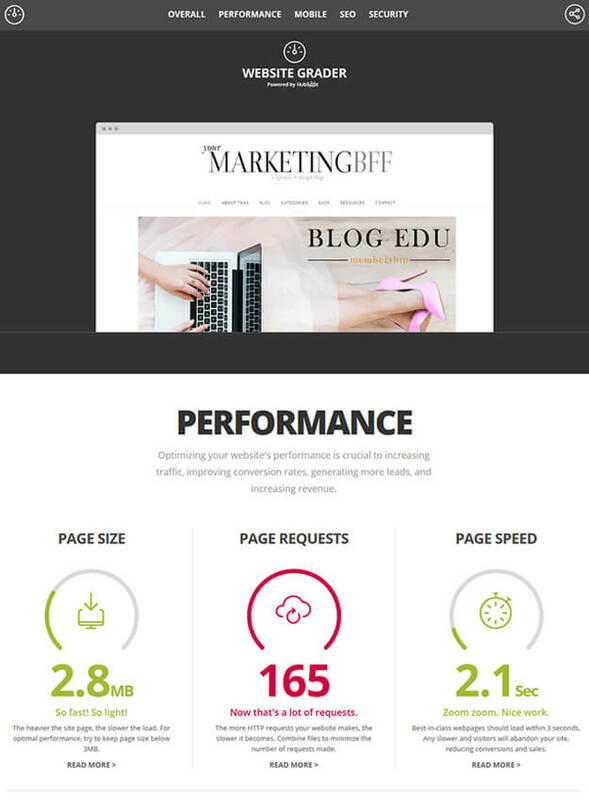 Page speed is also important to your visitor’s experience. Pages with a longer load time tend to have higher bounce rates and lower average times on pages. 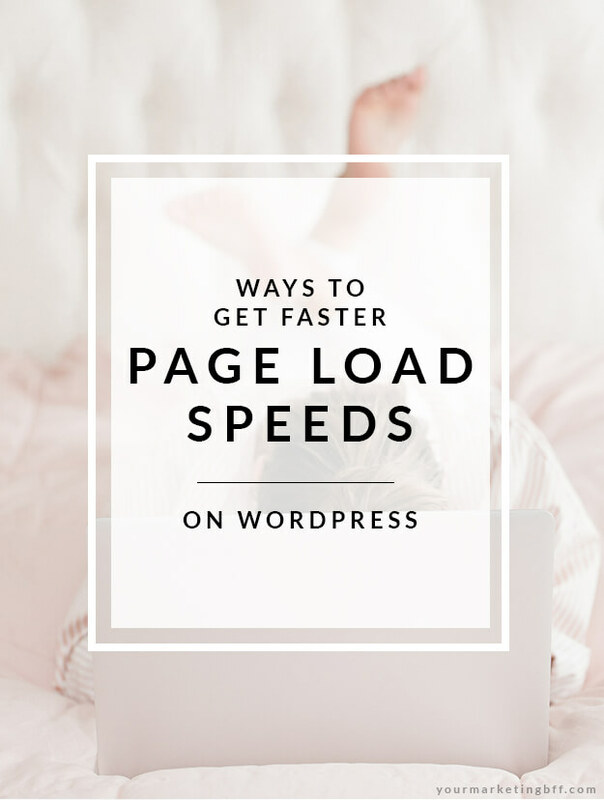 Page speed is a measurement of how fast the content on your page loads. What is a good load time? Before you start working on your site’s speed, it’s a good idea to know where you currently are in order to set a goal for where you want it to be. Speed is always important – the faster the better or the slowest your readers will allow. 80% of a web page’s load time is spent downloading the different parts of the page, like images, plugins, scripts and stylesheets. The first step to minimizing your requests is to figure out how many page requests your site currently makes. I like to use websitegrader.com to find out the number of page requests, as well as my page size, and page speed. If your site runs on WordPress, plugins like Fast Velocity Minify (free) makes the process fairly simple. By installing Fast Velocity Minify to my site, I immediately went from 165 page requests, down to 126 and from a page speed of 2.1 seconds, down to 1.6 seconds. Unused plugins are simply taking up space and time. So remove them. –Shareaholic plugin – these social share buttons are extremely slow for page speed. Before you go deleting all of these plugins, think about what they mean to your site and your reader. Weigh the pros and cons, then decide. For example, I use my homepage slider to educate new readers about my brand and key offerings. This is too important for me to NOT have at this time. I also use WooCommerce as my shopping cart experience and it’s free. Yes, I could replace this with something like shopify and pay $29 per month (base price), but it’s not worth it to me. Note: Removing some heavy hitters from homepages, and sitewide locations like footer and sidebar areas, might be a solution for you as well. For example, I could remove Instagram from my footer and place it on its own Instagram page (or remove it all together) to increase my site speed if needed. Be sure that your images are no larger than they need to be, that they are the right file format and correct resolution for the web which is 72 pixels per inch! Ideally you want to compress your image sizes prior to loading into your site dashboard. You can compress your image sizes within Photoshop or you can go to a free site like TinyPNG to compress your image sizes (which compresses PNG and JPEG file formats). You can also use a plugin like Smush to compress your image sizes once inside your WordPress dashboard. Note on file formats: PNGs are better for graphics, while JPEGs are better for photographs. Every time a page redirects to another page, your visitor faces additional time waiting for the redirect to complete. Browsers cache a lot of information (images, stylesheets, files, etc.) so that when a visitor comes back to your site, the browser doesn’t have to reload the entire page. The plugin LiteSpeed Cache for WordPress is what I use to speed up my site. Whether viewing from a desktop or mobile, site speed is always important to your visitors. That’s why I hope these different ways will help you speed up your website, get a faster load time, and give your users an even better site experience! So much helpful information here, Tana! I will be implementing all of your wonderful suggestions! Where would I be without you! I don't want to miss the latest. Sign me up for the newsletter!